When maintaining any kind of a healthy diet no doubt that salmon will likely be on the menu. Grilled salmon is absolutely delicious, naturally low in everything, and very easy to make. This recipe for low sodium grilled salmon is seasoned with the perfect blend of just a few herbs and the refreshing citrus taste of lime to create a beautiful, delicate flavor that you’ll love. 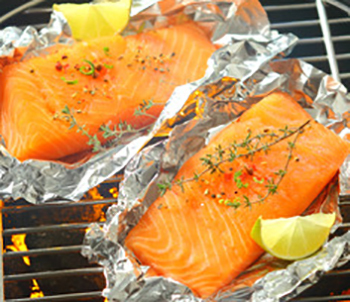 One of my favorite ways to grill a piece of salmon is to wrap it in aluminum foil and place it on the grill. This makes it real easy to manage and to clean as well. I like to get beautiful fresh salmon fillets and use this seasoning mix. The taste is so wonderful. When you first place your fork in to the freshly grilled, flaky fillet, you wont believe your taste buds. This is a recipe that wouldn’t need salt even if you weren’t maintaining a low sodium diet. It’s so naturally good without and added salt at all. You’re gonna love this low sodium salmon recipe. Place 2 salmon fillets each on a large piece of aluminum foil (enough foil to to gently wrap around fillets with room to spare). Squeeze juice of 1 lime over the fish and gently rub with dillweed. Thinly slice the 2nd lime and place slices over fish. Place sprigs of thyme on top and gently fold aluminum foil over to create pouches. Place pouches over medium heat on grill for about 12-15 minutes, rotating once after 7 minutes. Fish will flake with fork when done. Do you know how to cook the salmon in the oven? I like this technique–I need to know temp and amount of time. Thanks. Go with 375 degrees for 15-25 minutes, depending on the size of the salmon fillet. Give it a check with a fork after 15 to see how it is. You’ll probebly din it done at about the 20 minute mark on average. Good luck! Let me know how it goes.